Monroe Gallery of Photography: One Life: Martin Luther King Jr.
Gelatin silver print, 1956 (printed later) King proved to be the ideal choice to orchestrate and sustain the Montgomery bus boycott. 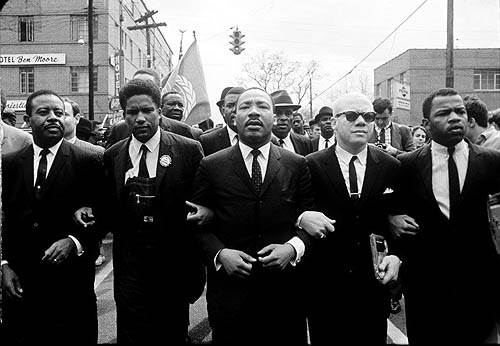 As a relative newcomer to Montgomery, he was able to bring together all factions of the black community without regard to past rivalries. Through inspirational addresses delivered at mass meetings in Montgomery’s black churches, King galvanized support for the boycott and clearly articulated the case for nonviolent action, declaring, “We must meet the forces of hate with the power of love; we must meet physical force with soul force.” He found a strong ally in fellow Montgomery minister Ralph Abernathy, and during the course of the boycott the two men forged a strong working relationship and a deep friendship. Continuing for an unprecedented 381 days, the bus boycott ended only after the United States Supreme Court ruled bus segregation unconstitutional. 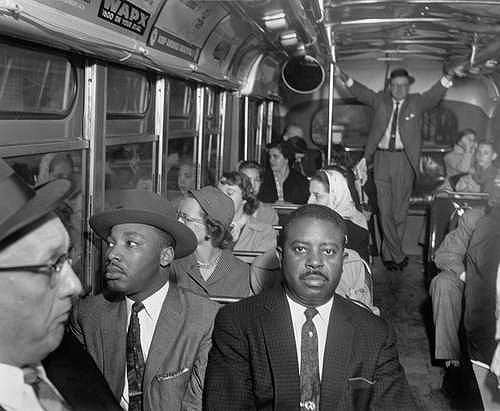 When the first integrated bus rolled through Montgomery on December 21, 1956, King and Abernathy sat side by side.